Along with the release of iOS 7, Apple has updated iTunes with several new features including iTunes Radio, Genius Shuffle, Podcast Stations, and a few changes to managing iOS devices. All new upgrades are available for both the OS X and Windows version of iTunes, which can be downloaded here. As with our guide to iTunes 11 Your Guide To The Awesome New Features Of iTunes 11 Your Guide To The Awesome New Features Of iTunes 11 Apple recently released the 11th version of its popular media player iTunes, and its re-design and new features have gained lots of praises from critics of the older versions of iTunes who found the player... Read More , this article highlights what you should know about the desktop version of iTunes. Provided you’re in the US, after you have downloaded and installed the new upgrade, iTunes opens with an invitation to iTunes Radio. This is Apple’s free streaming music service that works similarly to Pandora, coming to international users at a later date. The service starts you out with DJ-curated or hybrid featured stations that feature a collection of songs in various categories, from iTunes Top 100, Pure Pop, Beatles Radio, to Pure Gold. You can also create your own stations based on artist, genre or song, but you don’t have complete control over which songs appear in the station playlist, nor can you fast forward through or replay currently playing songs, which are played in real time. However, you can skip up to six songs per hour on any given station. iTunes Radio is a free advert-supported service, but users who subscribe to iTunes Match How to Set Up iTunes Match for the First Time: The Definitive Guide How to Set Up iTunes Match for the First Time: The Definitive Guide Our definitive guide to what iTunes Match is and how to upgrade all your matched songs to high-quality versions. Read More can listen to stations without interruption. The currently playing radio song is displayed at the top of the screen, but unfortunately upcoming station songs are not listed. You can right-click on the Up Next icon in the Play window to link to the currently playing song in the iTunes Store, or create a new station from the song or the artist. You can also see a list of previously played station songs. Placing your cursor next to the song name will reveal a drop-down selection for further customizing the station by selecting to play more songs like the current one, to never play the song again, to create a new station based on the song or to add the song to your Wish List. These same features can be accessed by clicking on the album stack of a radio station. Note: As of this writing, many iTunes users, including myself, experienced bugs in the system which either excluded Featured Stations, or found editing features missing. Clicking on Controls > Genius Shuffle in the menu bar (or pressing Option+Space Bar) tells iTunes to search your library and find a collection of songs that work together. 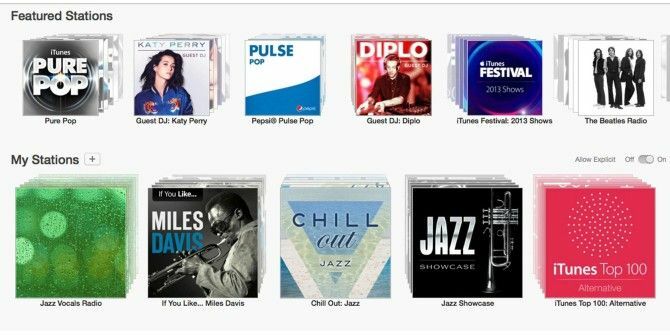 It’s similar to Genius Playlist Use iTunes Genius Mixes As Your Personal Music DJ Use iTunes Genius Mixes As Your Personal Music DJ Read More , but you don’t have to select a song to get it started. You can reshuffle songs as well as create a new playlist based on the currently playing song. Genius is a great way to listen to your iTunes library, and to discover songs you haven’t played in a while. Similar to iTunes Radio, the Podcast Stations feature allows you to create stations based on your subscribed podcasts. For example, you might create a station of related podcasts and listen to the current episodes one after another. The latest iTunes upgrades also include a few changes for managing iOS devices when they are connected to iTunes. I’ve covered how to organize apps and folders 4 Great Tips To Organize Apps on the iPhone iOS 4 4 Great Tips To Organize Apps on the iPhone iOS 4 Read More on your iPhone before, but the layout for that iTunes-iOS device section has been revised. When your iPhone is connected to iTunes you can manage and re-organize your iOS apps using iTunes and the changes will be pushed to your device. The new layout allows you to drag and rearrange entire pages, as well as apps and folders. To move an app to another page, you will need to double-click on it in order to drag it to a specific screen. 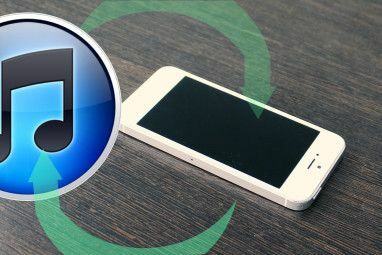 Though most iPhone, iPad, and iPod touch users back up their devices to iCloud, it’s a good idea to back up devices to you computer via iTunes. You can do this by setting up a USB or Wi-Fi connection to your computer and clicking on the listed device in the Sidebar of iTunes. You can set up a wireless connection by going to Settings > General > iTunes Wi-Fi Sync on your iOS device. By default iTunes will automatically sync your selected songs, music, movies, podcasts, and photos with your connected device. 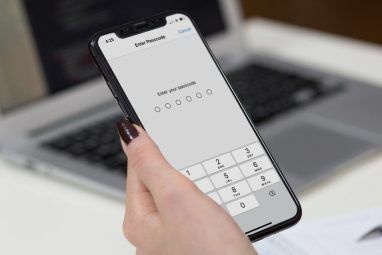 To make a full backup of your device, click Back Up Now under Backups, which backs up the device’s content to your computer or external drive. You can restore this backup if need be through the wired iTunes connection. 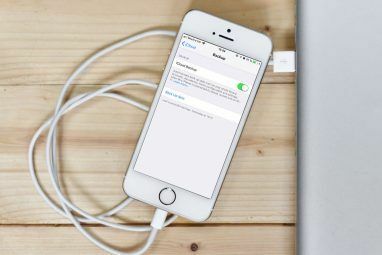 Note: If you choose the This computer setting, iCloud backup will be disabled and your phone will use your computer as a primary backup location instead. With these latest features of iTunes 11.1, the classic media player offers more ways to listen to music and podcasts. The streaming iTunes Radio in particular offers yet another way to enjoy music and discover new songs and artists. iTunes may often feel bloated for many users, but its multiple functions offer a variety of ways to make use of the application. Let us know what you think of the new features and how iTunes is working for you. Itunes remote for iPad was great, but with iOS7 it will no longer rotate to landscape. How very retro!! Disappointed that they removed the previous Radio Stations tab where I could look for sports radio or classical music stations (that were ad free or at least more ad free than the new one). *sigh* iTunes just stays annoying me by removing features I like and adding nonsense that I'll never use. It's still there. Go to iTunes > Preferences > General and select Internet Radio. Nice default setting so you hit up their iTunes Radio first. You should head over to the Apple Support site to see how other users are dealing with the problem. Apple does not seem to know whether iTunes is a music/video player or an iOS file manager. This latest update focuses on iTunes as a player. I wish it had focused on addressing some of the serious file manager shortcomings instead. For instance - the apps layout section has been revised, but does not offer additional functionality. Your screenshot shows a menu for "install" or "remove", but there is now also an "update" option. But this comes with a defect. If an app is updatable, you cannot remove it. Nor can you create an app profile for different purposes, similar to playlists. Nor can you make notes on apps, so that you can indicate which ones can be used for what (the names often don't help). Files associated with apps are listed, and files can be added, in iTunes, but files can't be removed. And finally - back to iTunes as a playing device - iBooks will not open on the computer, even if you have Apple's iBooks Author installed (which would be the logical integration). If iTunes is meant to be a player, it should be able to open any media files it holds, including books. If it is meant to be a file manager, then Apple should address its serious shortcomings in that arena. I was very disappointed in this update. Claire, I can't address all your points, but I do believe Apple will be releasing a separate application for iBooks on the Mac. I believe I read that somewhere a few months ago. the itunes 11.1 when downloaded in Genuine windows 7 ultimate (updated regularly) the itunes store will never connect as experienced by me .Further the Ipad 2 with IOS 7 could not be onnected. I have tried along with the apple rep for approximately 4 hours and it could not be connected to itunes store in HP DV6767tx laptop.But Itunes 10.5 connects to i tunes store in same laptop. Kindly inform if there is a special procedure or any other software. Roger, thanks for letting us know. Appreciate it. No cover flow, that's the end of the conversation. I had problems getting iTunes Radio to even work. It kept saying that I needed to authorize my device even though it already was. I re-authorized again anyway and it worked. Using iTunes on the PC to listen to Radio is a little flaky and I've had to restart the application at times to get it to work again. Hopefully they'll get the bugs worked out. Brian, yeah, looks like as if quite a few people are experiencing problems with the update.